Above and below is a BSA manufactured 'Long' Lee-Enfield, converted for use as a .22" training rifle. This example is a commercial version equivalent to the Rifle, Long, .22-inch, RF, Mark I, with the newly introduced solid .22RF barrel, neither bolt nor receiver mounted safety, and in a configuration more or less as supplied for Royal Naval training subsequent to the .297/.230 Morris tubes being rendered obsolete. The Birmingham Small Arms Company, as well as W.W. Greener and the London Small Arms Company, manufactured these rifles for Territorial Service Units, for the Society of Miniature Rifle Clubs and for use in the Colonies. The earliest conversions of the "Long" Lee-Enfield and Lee-Metford Service rifles to training rifles for the military (apart from the shortened versions - the Rifles, RF Short, Mks I & II - designed to emulate the S.M.L.E.) were the 1912 approved Rifles, Long, .22-inch, RF, Mk.I and Mk.I*, the former, as the example on this page, without safety, the latter retaining the bolt mounted safety. The Rifle, Long, .22-inch, RF, Mk.II succeeded the Mark I versions and was intended as a training rifle for Army units still armed with the now obsolescent .303 calibre 'Long Rifles'. Those rifles converted from Lee-Metfords had the bolt dust-cover removed.The last of the "Long Lee" conversions was the Rifle, Long, .22-inch, RF, Pattern 1914 - the rifle being converted from the Charger-Loading Magazine Lee-Enfield (C.L.M.L.E.). These aforementioned Pattern 1914 rifles are not to be confused with the .303" Centre Fire Service "Pattern 1914" (P '14 or Rifle No.3) introduced early in WWI, but also a conversion carried out by A.G. Parker Ltd. Above - Rifle LHS - Hiscock Parker Magazine shown not pushed fully home, it being necessary to open the cut-off ( usually removed on the military conversions) to permit this. Left below is the tangent rear-sight leaf modified for 25,50 and 100 yards with the leaf flat and 200 yards with the leaf raised. To the right is the original foresight with a protector pulled forward and over to the RHS for shooting. For the conversion of .303CF rifles to .22RF, apart from the .22" sleeve, and the removal of the bolt dust cover, the major modification was to the bolt-head. In early conversions, the original .303" bolt-head had the striker-hole filled and re-drilled off centre for the rimfire striker and firing pin. Later conversions used the purpose-built bolt-heads, initially just stamped ~~ .22"~~ and later, as fitted to most No.2 S.M.L.E. conversions, they were stamped ~ .22" No. 2 ~ as on the example below. Most conversions for military use had the magazine cut-off removed. That was not done on the illustrated rifle, a commercially converted BSA. The bayonet lug has also been left in place. This lug was removed on most of the "RF Short" training rifles, which were intended to emulate the S.M.L.E when that was introduced. - the C.L.M.L.E. or Rifle, Charger Loading, Magazine, Lee-Enfield. Most of the components in the .22RF conversion are the same, with only the barrel (if replaced with a solid one rather than being sleeved, for instance by the ParkerRifling system ),the bolt head with off-set rimfire firing-pin, the removal of the bolt-bodies dust-cover, and the removal of the spring and follower (cartridge loading platform) from the magazine to allow fired empty cases to be collected in the empty magazine case. The Birmingham Small Arms Company specifically advertised the merits of their .22RF barrelled conversion of the Lee-Enfield Mark I* Service Rifle. We replicate their pamphlet to the trade on the subject below. Note the comment on the change in the regulations by the N.R.A. regarding small-bore competition and rifle eligibility. The Service Rifle small-bore section of the Regulations in the 1912 NRA annual Bisley 'Bible', refers only to "Any .220 breach(sic)-loading rifle or carbine fitted with a barrel not exceeding 30 ins. in length, and complying with ..." then requiring a 4lb. minimum trigger-pull weight and permitting only iron sights and no 'glass'. We can find no mention of .297/.230 Morris calibres or their Aiming Tubes in that year. The only permissible .22RF cartridges could be Short, Long or Long Rifle. In the earlier 1908 Bible, for Miniature Rifle Short Range, permitted ammunition was .22LR, Morris (using rifles with solid barrels or with Morris Aiming Tubes) and any bullet no greater than 140 grains or cartridge not exceeding 653 ft.lbs., at 20 yards. Mid Range Miniature Rifle allowed any ammunition not exceeding 1,300 ft. lbs. This latter also allowed bullets "not needing to be inserted in the cartridge-case" at 200 gr. and loads to 1,700 ft.lbs. Cadet rifles of .310 calibre had to be used at ranges greater than 50 yards ( usually 200). At some point between these dates, terminology altered from Miniature Rifle (MR) to Small-Bore Rifle (SBR), and rimfire ammunition only became the standard. Miniature rifles were brought into competition by the NRA somewhere between 1902 and 1904. We will confirm this date more precisely in due course. FOR USE ON MINIATURE RANGES. 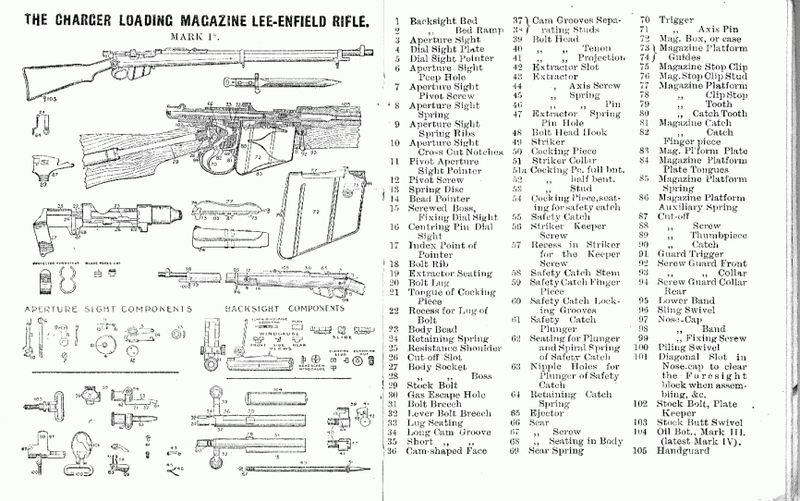 We illustrate in this booklet the Lee-Enfield Mark I* pattern with Service Sights. This rifle is in every respect similar to the actual Long Service Rifle, except that the barrel is bored and chambered to take either the .22 long or short Rim-fire cartridge. or the .297/230 Morris or short Central Fire Cartridge. 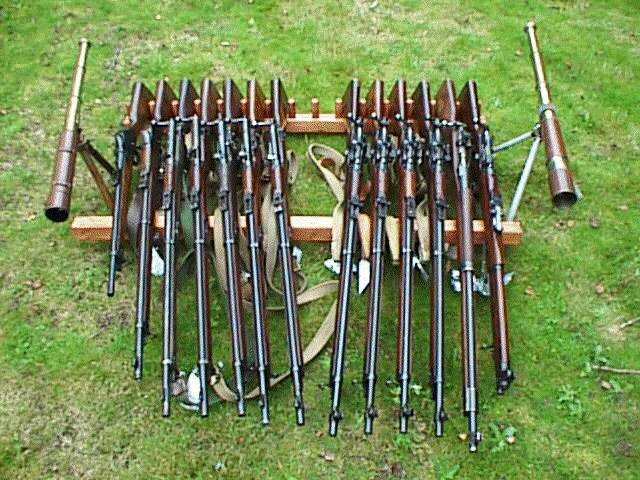 (2) Service rifles containing Morris Tubes. (3) Rifles of service pattern carrying a small calibre barrel. (4) Miniature rifles having military type sights. These labour under the disadvantage that a barrel, bored, rifled, and chambered in the first place for service cartridges, is prima facie unsuitable for low power cartridges of a radically different specification. practice cartridges in a service rifle without interfering with the original functions of the arm. Experience has, however, shown the undesirability of utilising the same rifle for the two purposes, and the use of tubes is accordingly limited by the War Office to rifles which are unserviceable for ordinary work. Such rifles are distinguished by the letters M.T. When tubes are used in a standard model of service rifle, central fire ammunition of comparatively high cost must be employed. The meritorious and inexpensive .22 rim-fire cartridge has lately received the official sanction which is embodied in its adoption for service use. When a Morris Tube is chambered for this cartridge it renders a modified bolt head and striker imperative to give rim instead of central percussion. The logical development of miniature practice with the service arm naturally embodies a rifle repro­ducing all the details of the service weapon with the exception of a barrel specially bored to take the .22 cartridge andi a bolt adapted in the head to detonate a rim-fire case.With such a combination the lack of co-ordination between the lie of the tube and the side adjustment of the sights at once disappears, and the marksman is encouraged to develop an increased standard of performance commensurate with the improved accuracy of his practice, rifle, and cartridge. MINIATURE RIFLES WITH OPEN SIGHTS. The exact degree to which shooting at miniature distances should re‑ produce the sensations to eye and hand which appertain to the service rifle is a much debated point. Considerations of economy nevertheless justify the recent introduction of a cadet model of rifle, which departs one stage further from the ideal of practising with the military rifle at full military distances Its lightness of con­struction has the great advantage of diminishing the fatigue experienced by the beginner whose muscles are as yet unaccustomed to the peculiar Mains put upon them by rifle practice. (1) The miniature rifle pure and simple. ...................................(2) The service rifle with reduced charges, however adapted. (3 )The service rifle with full charges. Where circumstances are suitable practice could be commenced with the reduced charge service rifle: but in any case the .22 Lee-Enfield would be selected on common-sense grounds as the rifle best carrying out the conditions aimed at. On the question of relative cost it must always be remembered that whilst an M.T. (Morris Tube) rifle and a tube are well-nigh worthless when worn out by constant use, and possibly neglect as well, the .22 Lee-Enfield can at a small cost be converted into a service rifle, having a barrel new inside. When the full service rifle comes to be regularly used, its reduced-range counterpart, if still retained, will prove "most valuable as a means of keeping the eye and hand in thorough training. The Lee-Enfield Rifle, specially chambered and bored for the SHORT .22 CARTRIDGE, is peculiarly fitted for the use of Volunteers and others in the Drill Halls or indoor ranges. The accuracy of a rifle so bored cannot he excelled, whilst this type of the Lee-Enfield, using the ordinary short black cartridge or smokeless cartridges of approved specification, must recommend itself as the best for those who want INDOOR PRACTICE WITH THE MILITARY ARM. "The B.S.A. Rifles Mark I*, taking the .220 Cartridge, have proved very true and excellent weapons, and the finances of the Club have certainly benefited by the use of the comparatively­ inexpensive ammunition." These rifles were advertised in the BSA 1909 catalogue as being available in .22RF and 297/.230 CF Morris as well as in .303" service calibre. The image below is of a collection, mostly of "Long" Lee-Enfields, brought together for the Centenary Match between Colchester Rifle Club and the Royal Regiment of Fusiliers; formerly the 4th. Royal Warwickshire Regiment. The match, held on September 11th. 1999, was a hundred year follow-up of one held at the turn of the (nineteenth) century. Fifteen "Long Lees", an unprecedented assembly, were begged from a number of sources. The N.R.A. Museum even kindly loaned one made by Tippins of Mistley, Essex, and used in 1906 to produce a then world record score of 105 X 105. On the Left is a Martini Enfield carbine, on its right is a Martini Metford rifle, and on the extreme right is a nowadays sought-after fine example of a No.1 Mk.I Short Magazine Lee Enfield. A most interesting aspect of the introduction of the first Magazine Lee-Metford rifle was a lengthy criticism of the design and manufacture of the first issued units, as compared with the preceding Martini-Henry service rifle. The criticism was presented in the House of Commons by one Mr. Majoribanks on 3rd. February 1891, and was reported in Hansard as replicated in the scrollable PDF below. That such considerable negative opinion should have been put forward after only trialling of early rifles, is retrospectively eye-opening. In view of the subsequent longevity and sterling performance of the Lee-Metford and Lee-Enfield designs, through many marks, and at least three major following wars, it is indicative of how seriously conservative thinking can potentially set back major advances in almost any field.